THE FINAL CHAPTER IN THE STORY OF SARA PEZZINI! 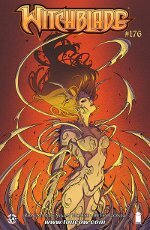 During her twenty years as Bearer of the Witchblade, Sara Pezzini has traveled the globe to do battle with just about every form of evil under the sun. When a powerful collector of the supernatural offers Sara a job, though, she finds herself called back to where it all began: New York City. Written by Ron Marz, Maan House Published by Image Comics On March 2016. An oversized hardcover (12 x 8) celebrating 20 years of Witchblade with a veritable who's who of comic artists. NOTE-This is an original book, not a hardcover reprint of THE ART OF WITCHBLADE. Written by Michael Turner Published by Dark Horse Comics On November 2015. Written by Ron Marz, Stjepan Sejic, Laura Braga Published by Top Cow On September 2015. Written by Ron Marz, Stjepan Sejic, Laura Braga Published by Image Comics On July 2015. Ending her hiatus time spent separated from the Witchblade, Sara Pezzini retook possession of the ancient artifact to prevent it from falling into the hands of the Angelus. 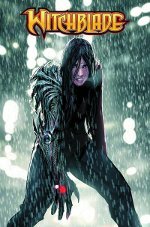 During her struggle to regain the Witchblade, Sara learned the new Angelus is Jenny Romano, Darkness bearer Jackie Estacado's wife. With that discovery, Sara takes up the case as to how Jenny, wife of the Darkness, became the Angelus, all while the Witchblade has plans for Sara of its own. Written by Ron Marz, Laura Braga Published by Image Comics On June 2015. Written by Ron Marz, Stjepan Sejic, Maan House Published by Image Comics On April 2015. Written by Stjepan Sejic, Laura Braga, David Hine Published by Image Comics On March 2015. 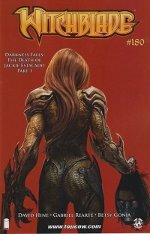 DARKNESS FALLS IN WITCHBLADE'S 19TH ANNIVERSARY! In another life Jackie Estacado was Sara Pezzini's lover and the father of her child. Now he has used the power of the Darkness to endanger the whole of human existence and only the Witchblade can stop him. Here at last is the untold story...the Death Of Jackie Estacado! Written by Stjepan Sejic, Laura Braga, David Hine Published by Image Comics On February 2015. Written by Dale Keown, Laura Braga, David Hine Published by Image Comics On November 2014. Written by Ron Marz, Laura Braga Published by Image Comics On October 2014. While evading the supernatural forces that wait for her, Sara Pezzini must solve the mystery of the Angelus's new host to keep balance in a world with no Darkness. Written by Ron Marz, Laura Braga Published by Image Comics On July 2014. Sara Pezzini believes her life is returning to normal ... at least normal for someone who wields an ancient gauntlet of immense supernatural power. But when dark secrets about an abandoned amusement park surface, Sara's investigation draws her into living nightmare. 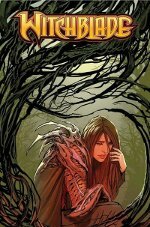 This first volume in a new series of WITCHBLADE collections provides a perfect jumping-on point! 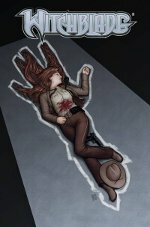 Sara Pezzini has given up the Witchblade and taken up the life of a small-town Sheriff, but her past comes back haunt her in deadly fashion. 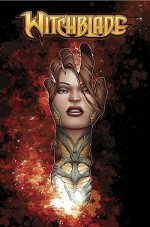 Acclaimed writer RON MARZ returns to the series, working with gifted artist LAURA BRAGA to tell the next chapter in the life of Sara Pezzini and the Witchblade! Written by Ron Marz, Marc Silvestri, Laura Braga Published by Image Comics On July 2014. Starting a new storyline, the team of writer RON MARZ and artist LAURA BRAGA continue their acclaimed run, providing an entry point for new readers, as well as a celebration of all that's gone before. 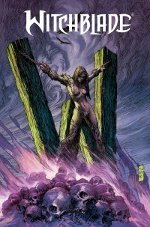 Also features a second story by MARZ and BRAGA, revealing a previously untold tale of the Witchblade in feudal Japan, as well as other bonus features. Written by Ron Marz, Laura Braga Published by Image Comics On June 2014. Written by Ron Marz, Laura Braga Published by Image Comics On April 2014.